Synopsis: NYT bestselling author, M. J. Rose crafts a dazzling Jazz Age jewel--a novel of ambition, betrayal, and passion. My Review: Jenny Bell is an aspiring artist with a dark past. One day, she gets an opportunity to join Louis Tiffany’s reputable artists' colony. Once she is there, she hopes to get creative with her work. However, she soon falls in love with Oliver, Louis Tiffany’s grandson. Her happiness with Oliver is quickly threatened when someone plots to expose Jenny’s dark secret. Could Jenny find this malicious person before her identity is exposed or does Jenny lose everything that she holds dear? I find Jenny Bell to be quite bland. She is the typical heroine that you have read before in a hundred gothic romances. She is a meek heroine who had a tragic past. There is nothing special about her. She is a typical Mary Sue and a classical Jane Eyre. Therefore, there was no character development for Jenny. She is the beautiful but flawed heroine. She is also a damsel in distress and is very weak-willed. She is always waiting to be rescued by her handsome hero. She had no depth to her. I did not know anything about her except that she likes art. Thus, Jenny’s impression left no impact on me because I have seen her character many times before in other gothic romances. Jenny’s character is almost an exact carbon copy of Simone St. James’s character Kitty Weeks in Silence of the Dead. Overall, Tiffany Blues is unoriginal and predictable. The characters are stereotypical. Oliver is the dashing, handsome hero with no personality. The villain is cartoonish and is the classical bad guy. The motive for wanting to expose Jenny’s past is ridiculous, laughable, and does not make any sense. The pacing drags, and nothing happens throughout much of the novel. The author does write eloquently, and her writing is very detailed. However, vivid descriptions and gorgeous writing should not be used to disguise a thinly designed plot. Therefore, I was very disappointed in M. J. Rose’s latest novel. I loved her Daughters of La Lune series, and The Witch of Painted Sorrows is one of my favorite novels of all time. However, this one fell flat. 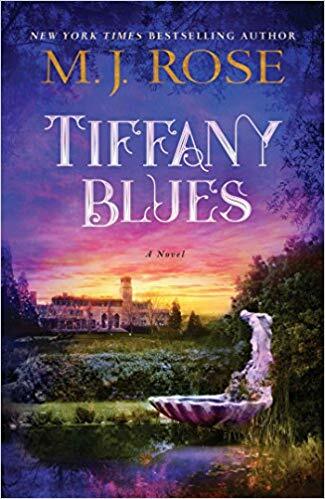 In Tiffany Blues, there was no freshness to the story, but rather was a story that other gothic authors have written before. It was as if M. J. Rose lost inspiration for her novel and decided to tell a generic and recycled plot. Thus, Tiffany Blues is a forgettable novel that lacks creativity. I suggest that you skip this novel and read The Witch of Painted Sorrows instead. It is in that novel that M. J.Rose truly shines.